The other night I got stuck working a little later than normal and didn’t have time to run to the store to pick up ingredients for dinner. At first I thought “Ok, no biggie, we’ll just do takeout”… but I really can’t stand takeout anymore except for the occasional guilty pleasure of Chinese or Pizza. What it costs us to get crappy food delivered is roughly the same as picking up the ingredients to make a great dish on my own. It’s just hard for me to stomach that. So I said “Screw it, I’m going to make due with what I have and try to put something together”… and what I came up with was a mac ‘n cheese pot pie. Yup, you read that right, a mac ‘n cheese pot pie. Two things… First and foremost the watercress in the picture was purely garnish to give the dish more color for the picture’s sake. Don’t get me wrong, I ate it, but it certainly didn’t add anything to the dish which is why it is not in the recipe. Secondly, there have been some comments that many of my recipes lately are spicy. Yes, there is Sriracha in this dish, but it’s not enough to make the dish spicy in the least. However, it does add a greater depth of flavor. If you don’t want to use it, then don’t. If you want spicy, add more. Boil your pasta in salted water for two minutes less than the product calls for. While the pasta is boiling melt 3tbsp of butter in a medium pot on high heat. Add the flour and stir until the roux turns to a light caramel color. Add the buttermilk and whole milk, stirring continuously. At first the roux will likely clump up but as you continue to stir it will blend into the liquids. Bring to a boil then reduce the heat to medium. Add the cheeses, tomato sauce, sriracha and seasoning and stir until melted and well combined. Add the cooked pasta and stir well. Pour the mixture into an 8″x8” baking dish and put in the oven for 20 minutes. After 20 minutes remove the mac from the oven. Lay the puff pastry sheet over it and fold over the edges. Brush the pastry with melted butter and sprinkle it with the dried oregano, salt, pepper and garlic powder. Put the dish back in the oven and cook until the pastry rises lightly browns, approximately 15 minutes. There you have it, my sick in the head idea of topping carbs with more carbs! You probably won’t like me the next morning, but trust me when I say you’ll love me while you’re eating it… haha. Enjoy!!! 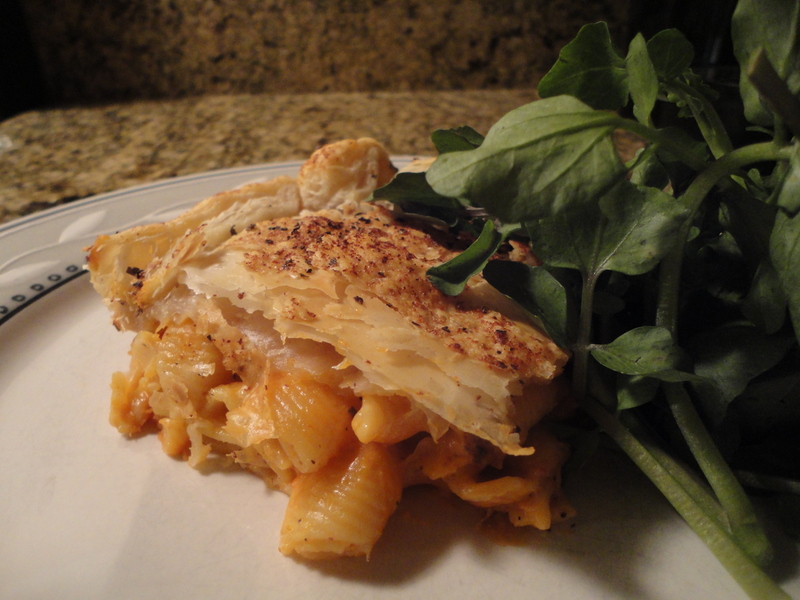 Tags: mac n cheese, mac n cheese pot pie, perfect pairings, perfect pairings at home, pot pie, puff pastry, sriracha. Bookmark the permalink.